Now since the children have flesh and blood in common, Jesus also shared in these, so that through His death He might destroy the one holding the power of death—that is, the Devil—and free those who were held in slavery all their lives by the fear of death. Overcoming Fear is a MUST for all believers! Every human being will experience fear in their life, but very few will do the work to overcome it and banish it from their lives. As born-again believers, we have been freed from slavery to fear, but do we live in that freedom? Do we walk through this world fearing only God? Or do we accept fear as a natural and normal part of life and excuse its hold on our hearts? Overcoming Fear by Martha Kilpatrick is a powerful teaching that identifies the source of fear, illustrates the consequences of fear, and reveals the path to overcoming fear for life. We are not meant to live in fear and we should not do so. Victory is ours through the precious Blood of Jesus Christ, so claim your victory over fear today! 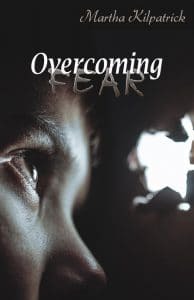 Overcoming Fear is available exclusively in Kindle format at this time. The sin of fear is much closer to the sin of unbelief than anything else, and I suspect that fear follows unbelief. In the Parable of the Talents, the man who buried his talent did so because of fear. He did not believe in the goodness of God and so he was afraid. The war of your life is going to be between what God has promised and provided for you, and your own human fear fed by the assault of the enemy on those very promises and provision. Everything God demands of us He will Himself perform, but the man who believes he is inadequate for what God has called him to do and doubts that God can perform it becomes afraid. And wherever we are afraid, we want something for ourselves. If something makes me anxious, I can take the covers off of it and it’s something for my sake. ‘For my sake’ enthrones Satan and gives him permission to move in that area of my life. And so fear takes us to immorality, just as it did in the beginning. Eve feared that she did not have enough and down she went. A fearful person is going to be lawless, whether overtly or covertly. So fear must be overcome. Take [with me] your share of the hardships and suffering [which you are called to endure] as a good (first-class) soldier of Christ Jesus. No soldier when in service gets entangled in the enterprises of [civilian] life; his aim is to satisfy and please the one who enlisted him. Entanglement usually comes from fear. There is a way to be objective and uninvolved, even when crisis is all around you. You can be a soldier so focused on the business of another realm that this realm holds no entanglement for you. And that’s what we need to come to: a detached life, disentangled, with no fear. This writing of Chambers came alive to me one day while watching a movie. There was a scene where a commanding officer was speaking to his men before battle. He said, “You are here to die. You came here to die. Don’t consider going home. Don’t think about returning home. You are here to die. Some of you won’t and some of you will, but you all came to die.” Oh boy, I’ve never seen any military officer put it to his men to that degree! That was reality. God prepares His people for suffering by teaching them how to be without fear and how to die. The first century church learned it and conveyed it. Back then there was no question that you became a Christian to die. Many of us didn’t come in to this born-again, Christian life ready to die. We’ve had to learn it the hard way. In western civilization, too many believe that when they receive Christ and are born again, they come into all the blessings with no cost. And most of the people that I have seen fall away are those who aren’t willing to pay the cost. These are the people who signed up for something that would enhance them. They signed up, but not to die. They came on board for blessings, not death. Jill Briscoe was led to the Lord by a woman who said to her, “Don’t receive God in Christ unless you’re willing to have a miserable life, to suffer, to be sent wherever God wants you to go. It’s possible you will never marry or have children. If you aren’t willing for the worst of it, don’t even sign up.” That woman introduced Briscoe to Christ the right way. The first century believers understood clearly that they would die. When they signed up to receive Christ as Savior and be born again, they were signing their death warrants—very possibly a hideous death warrant. Today’s Chinese Christians understand that same reality and are willing to pay the price. When they experience suffering, they’re ready. They knew the price when they signed up. Here in the west, we don’t know the price. And brothers and sisters, we must understand the price! Jesus takes us issue-by-issue to resolve our fear, and Luke 12 is a good place to start. Be on your guard against the leaven (ferment) of the Pharisees, which is hypocrisy [producing unrest and violent agitation]. Jesus assures us in the next two verses that everything will be revealed. And Jesus, in His own dealings with the Pharisees, certainly revealed all. He revealed it to them! He declared in the Word of God forever what was in their hearts. And who was it that killed Jesus? It was the Pharisees. Religious evil is the most dangerous and murderous of all evil. Jesus then addressed His disciples as friends. There were only a few times that He called the disciples friends, and Luke 12 is one. “I say to you, My friends, do not be afraid of those who can kill the body and after that have no more that they can do. But I will warn you whom to fear: fear the One who, after He has killed, has authority to cast into hell; yes, I tell you, fear Him!” (v. 4-5 NASB). When David was stricken with remorse over cutting off the corner of Saul’s robe, it was not because of something that Saul would to do him. No, David was stricken because he feared the Lord: “Far be it from me…to stretch out my hand against him, since he is the Lord’s anointed” (1 Sam. 24:6 NASB). David grew out of the fear of man, which was the fear of death, and into the fear of God.